If you already have a small battery and just need the mounting kit here is the perfect solution. Designed around the Hawker PC680 battery, the mounting bracket is CNC waterjet cut from 1/8" thick aluminum and utilizes 3 mounting points. The battery tray is CNC machined from 1/2" thick aluminum then TIG welded to the mounting bracket to hold everything in place. To top it off the battery tie down is CNC machined from 1/2" thick aluminum and is engraved with the JMF logo. The tie down is polished to a mirror finish at no extra cost to you. This will fit the Hawker PC680 battery as well as other batteries with the same dimensions. Battery is NOT included. 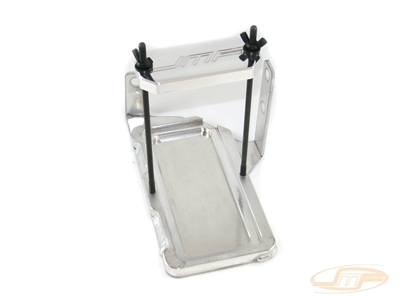 JMF Small Battery Tray for the DSM/EVO. Battery NOT included!